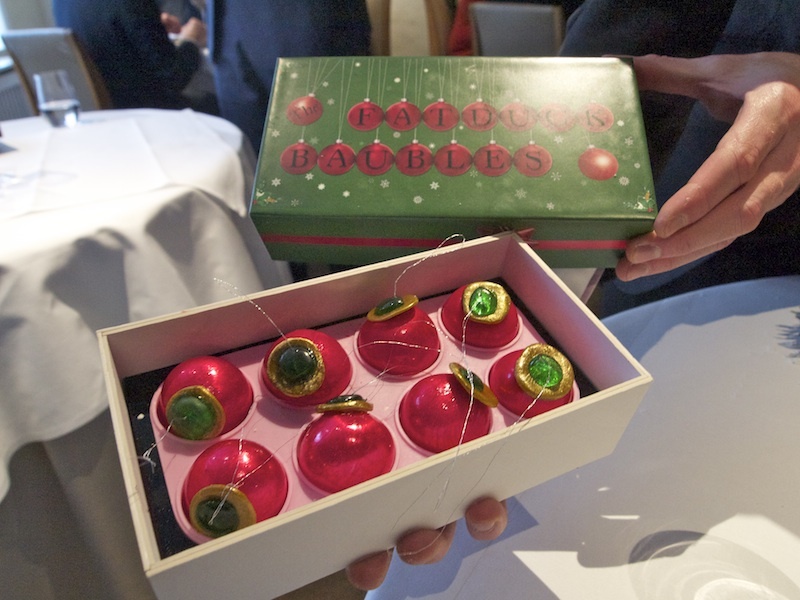 From the Fat Duck Christmas menu: The chefs prepared for me ..... 12 children chewing, 11 candles glowing, 10 eggs-a-scrambling, 9 grapes-a-baubling, 8 apples pressing, 7 partridges pearing, 6 turbot tanning, 5 gold, frankincense and myrrh, 4 snails porridging, 3 lollies licking, 2 pine cones poached ..... and a Heston on a Christmas tree. 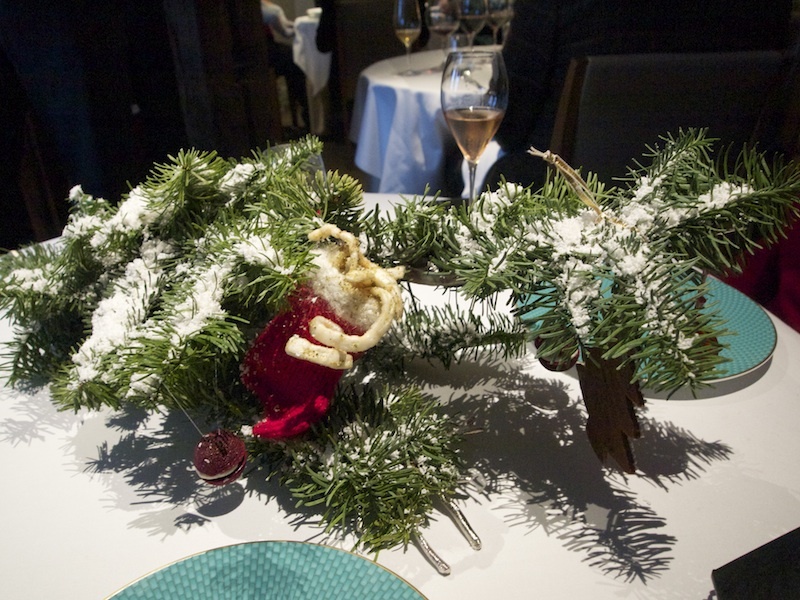 Last month, The Fat Duck in Bray announed that for that for the first time ever the restaurant would be serving a special 12-course Christmas lunch menu on 3 Sundays in December 2012 (2, 7 and 16 December). Since 16 December is the day that my husband and I first met 17 years ago, there was only place I wanted to be this anniversary and fortunately I was able to get two tickets for this special Christmas lunch. Within seconds after we had been seated at our table a selection of vintage and non-vintage white and rose champagnes was presented to us from which we selected the delicious Cuvée William Deutz Rosé 2002 as our aperitif. After we had finished our glasses of champagne, the Christmas menu kicked off. First course: Christmas tree. 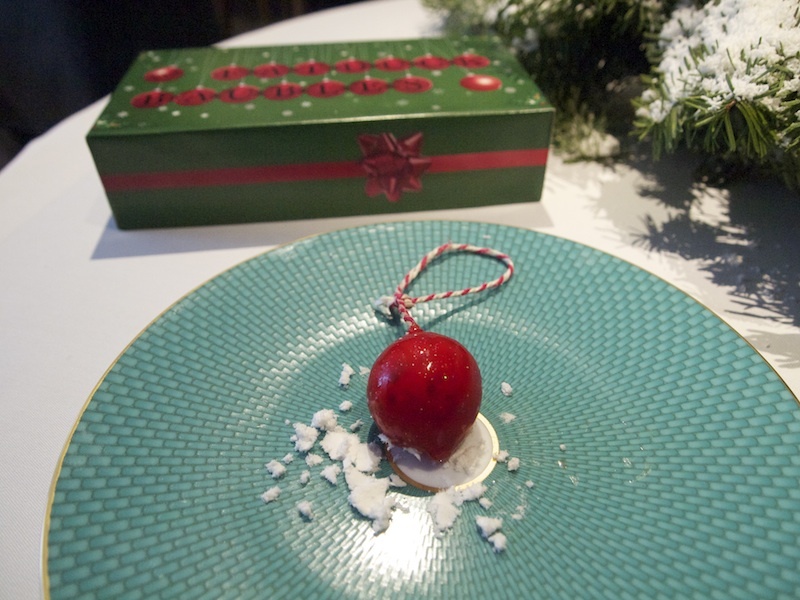 A Christmas tree branch, covered with edible snow, was carefully placed on our table and then a member of staff presented a box with Fat Duck langoustine cocktail baubles. Two of these baubles were placed on our plates on top of some of the edible snow. In the tree were aerated beetroot and horseradish macarons, pork crackling and two brawn baubles. The edible snow had a texture similar to icing sugar and wonderful creamy and citrussy flavours. You were encouraged to eat the snow with your fingers, which I did enthusiastically. The baubles. First the langoustine cocktail bauble. A beautifully made thin blown sugar bauble with a wonderful creamy langoustine cocktail filling. The brawn bauble had a delicately flavoured red pepper and cardamom jelly casing and a delicious soft and smooth brawn filling, rich yet elegant. The aerated beetroot macarons were as great as always. Lovely earthy beetroot and creamy horseradish with the perfect touch of sharpness. The pork crackling (served in a small Christmas stocking) was wonderfully crunchy and had a delicious sprinkling of sage and onion powder (made from dehydrated sage and blanched, fried and dehydrated onion). A brilliant and very entertaining start of this Christmas lunch. Second course was a Christmas version of a Fat Duck classic: Nitro poached pine aperitif. 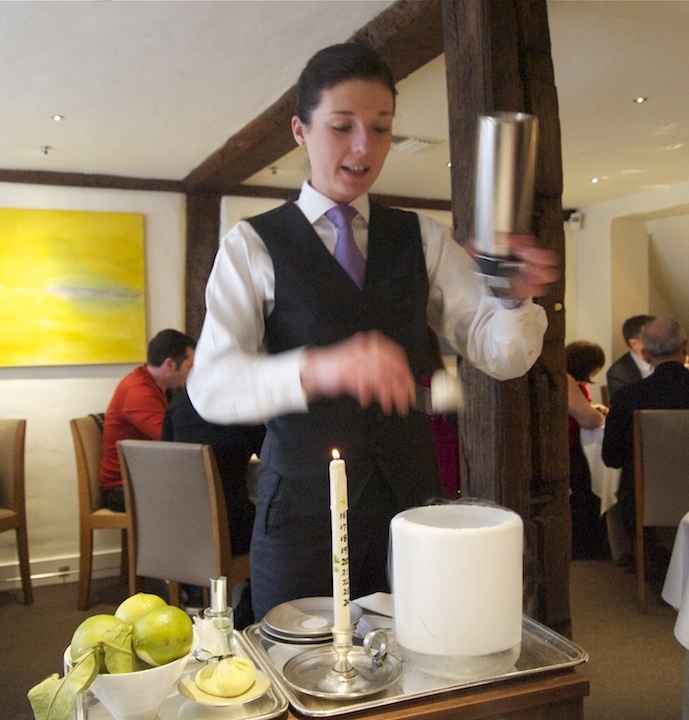 Gin, tonic, pine and cedar extract mousse, poached in liquid nitrogen and then sprinkled with bergamot zest. A great palate cleanser with complex flavours. It needs to be consumed within seconds after it has been prepared, or you miss out on the full experience. A puff of smoke comes out of your nose when you eat this aperitif and the liquid nitrogen (-196 degrees) preparation provides a terrific tingling sensation on the tongue. The advent candle that you see in the photograph will play a role later in the meal. On to the third course: Savoury lollies. 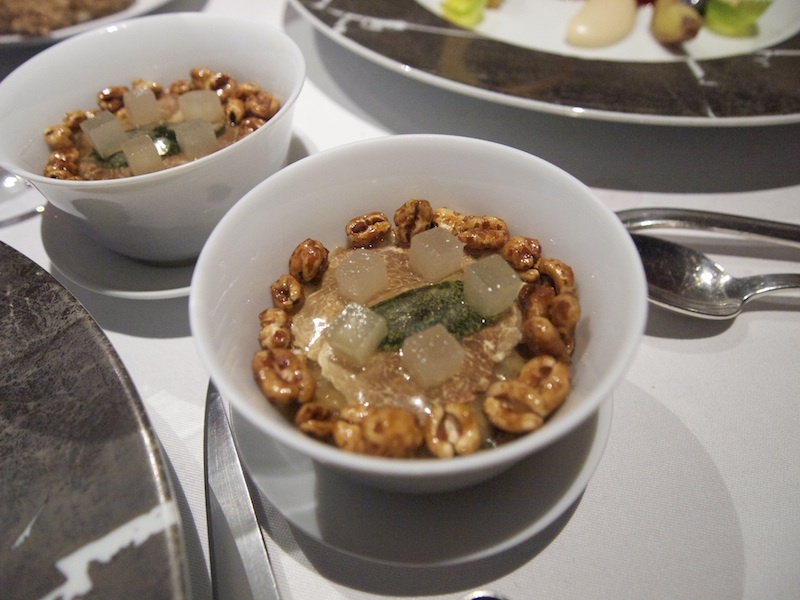 A relatively new Fat Duck dish that consists of three savoury lollies based on the retro classics (i) Waldorf salad, (ii) salmon and avocado and (iii) chicken liver parfait. The Waldorf Rocket had three layers of very intensely flavoured apple, celery and grape and walnut. Intense but very refreshing and the combination of the tree really conveys the flavours of an elegant waldorf salad. Next a salmon, avocado and horseradish Tangle Twister. Lovely cured and tea-smoked salmon which had a nice, lightly salty finish, was wrapped with perfect, thin layers of smooth avocado and horseradish cream. Very comforting. Finally the chicken liver parfait Feast. A gorgeous, velvety chicken liver parfait with a mulled wine jelly casing and dipped in finely chopped almonds and cocoa nibs; the combination of these flavours and textures was brilliant and wonderfully indulgent. 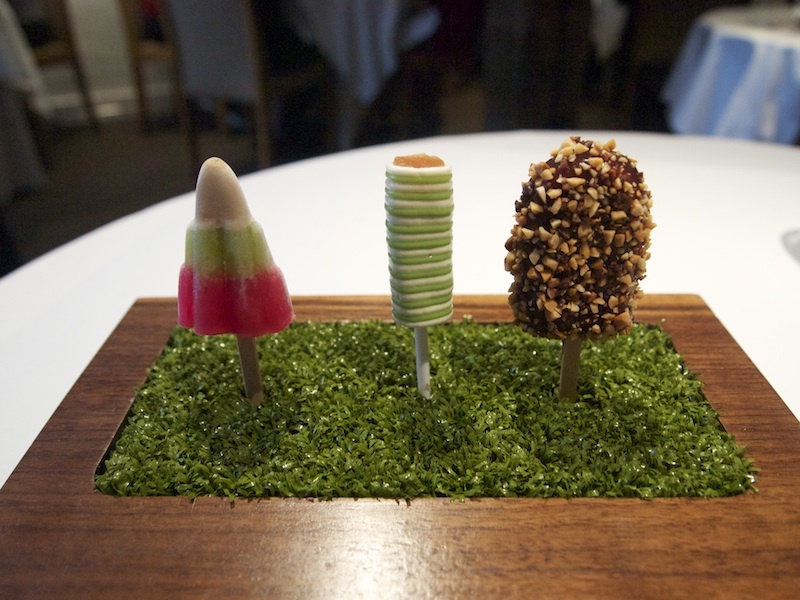 Last week these savoury lollies featured In the Fat Duck episode (12 December 2012) of "Masterchef The Professionals" and head chef Jonny Lake said about them: "They just have to look so perfect, they're just out there all on their own". Well, they were perfect and I adored the presentation. Fourth course was Snail porridge. 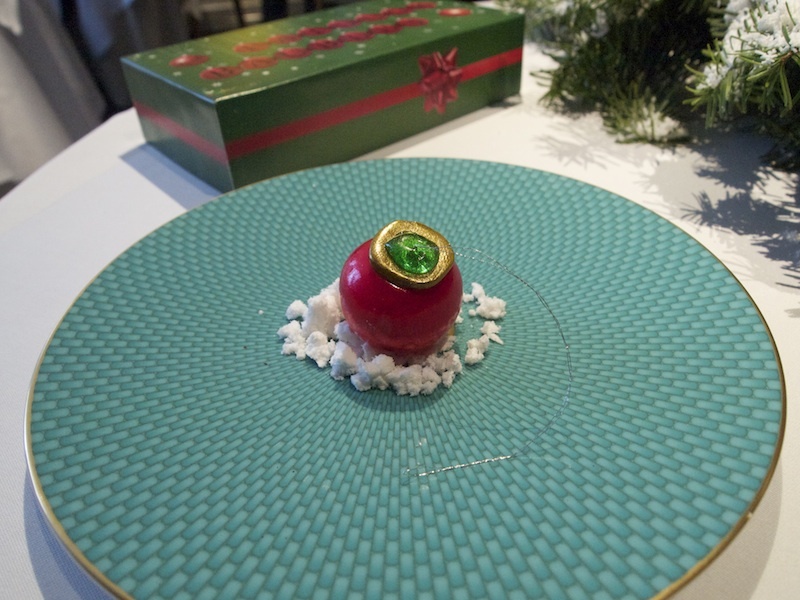 I was really happy that this iconic Fat Duck dish was part of the Christmas lunch menu. Gloriously luscious and colourful porridge topped with chiffonade sliced Bellota ham, tender braised snails and thinly sliced fennel, lightly marinated with walnut oil and walnut vinegar. 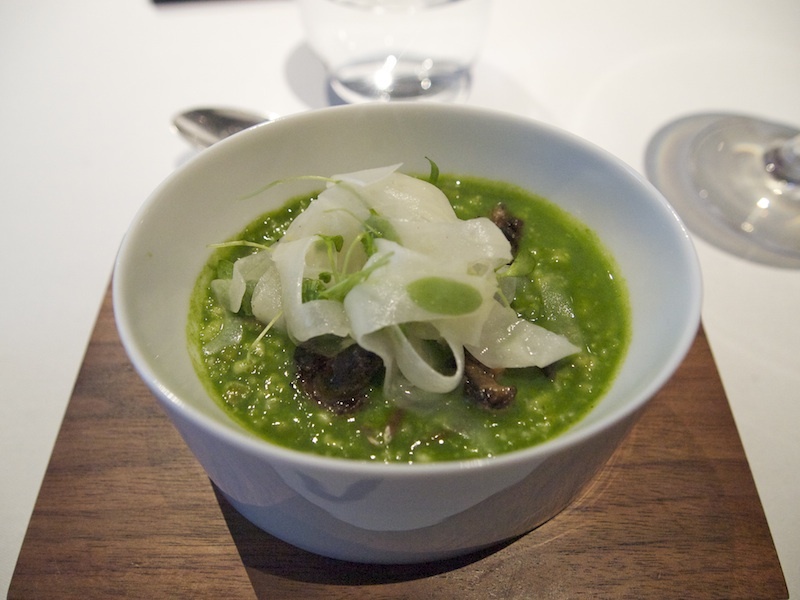 Beautiful, pure parsley flavours in the porridge and the Bellota ham added depth and a wonderful touch of natural saltiness. Great texture from both the snails and the fennel. Marinating the fennel gives you the lovely, elegant, aniseed flavours of the fennel without the sharpness of the raw vegetable. A highly addictive dish with complex, but linear flavours. Fifth course: Gold, Frankincense and Myrrh. An elaborate dish that consists of many elements. 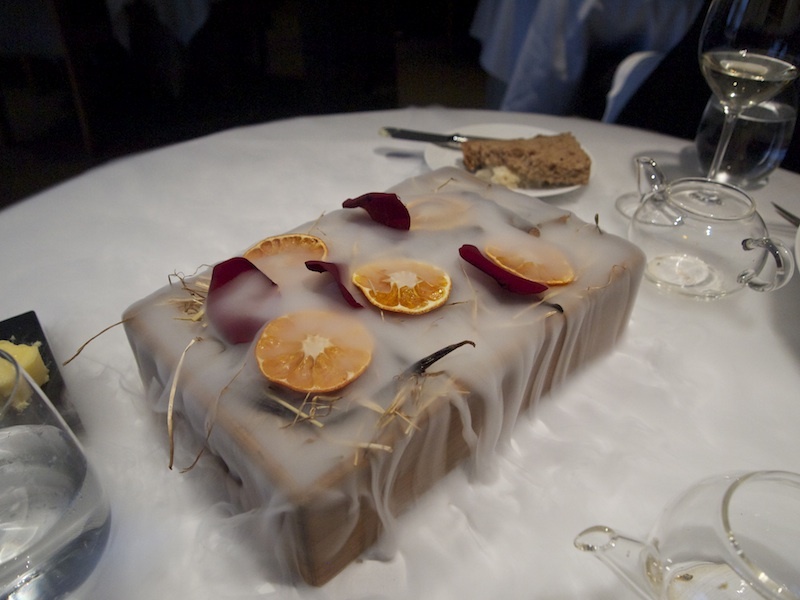 First a wooden tray with dry ice is placed on the table into which myrrh scented hot water is poured, after the other parts of the dish have been served, to create a beautiful, dramatic and fragrant effect. I was presented with a golden langoustine bouillon bar in box made from myrrh. 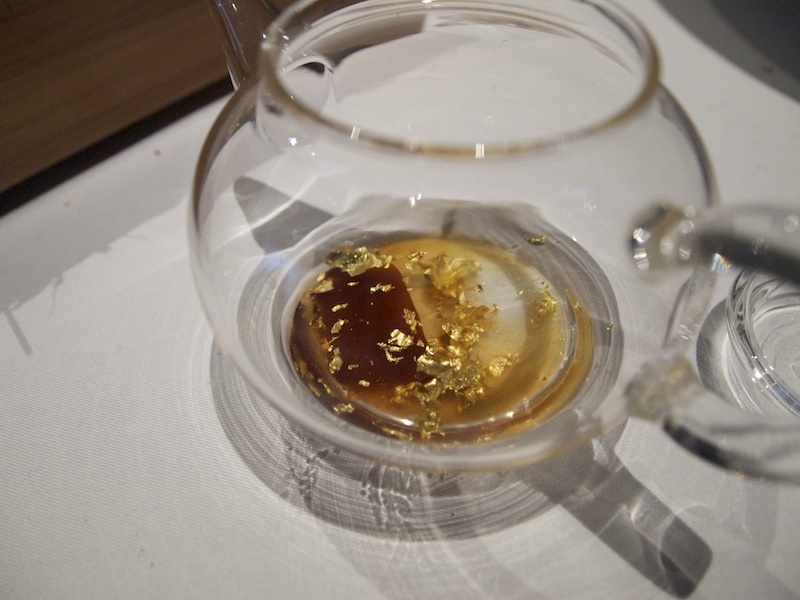 I was asked to place this gold bouillon bar in a teapot filled with hot water infused with frankincense, to create an amazingly clear langoustine bouillon. 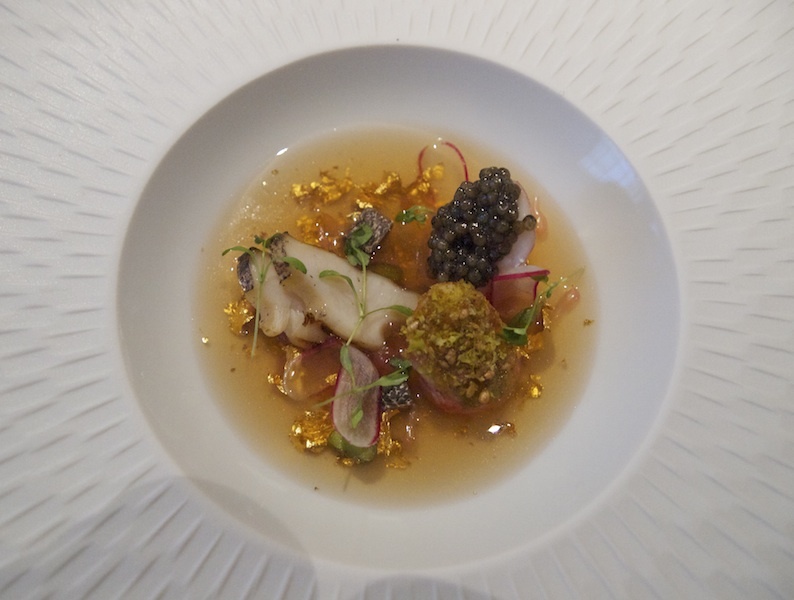 The bouillon was then poured into a plate with langoustine and chargrilled abalone on it. The langoustine was sweet and tender and had two delicious toppings. One was a generous dollop of caviar and the other one was finely chopped crackling made from salt and vinegar cured pork crackling - a fantastic flavour combination. The lovely, tender abalone had light, chargrilled flavours. 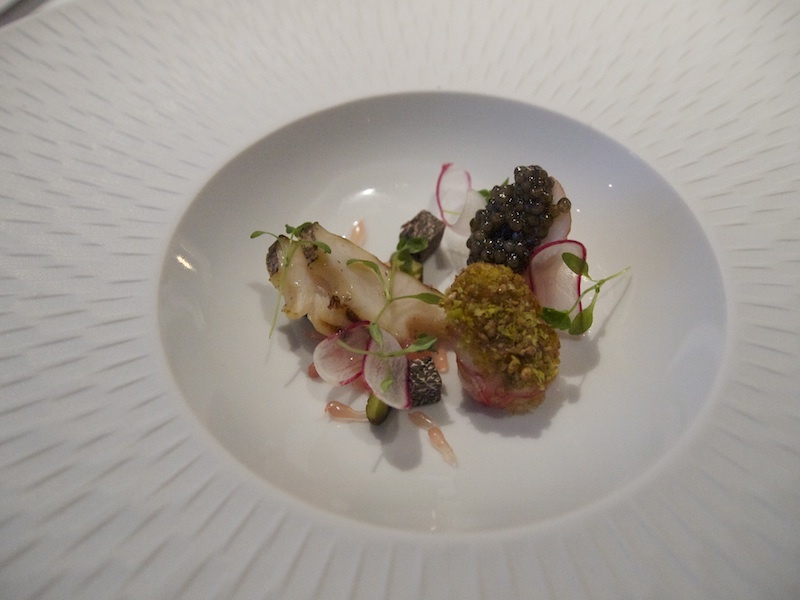 Also on the plate were a few cubes of truffle, grapefruit vesicles and thinly sliced radish. The grapefruit delivered a nice, bitter contrast to the natural sweetness of the fresh langoustine and langoustine bouillon. Last but not least there was a small glass bowl filled with a delicious rich and concentrated langoustine 'royale', a lovely light mandarin pickle foam and a beautiful ring of golden trout roe. This was a sensational and incredibly refined dish that was a feast for all the senses. Sixth course: Tanned Turbot. The idea for this dish originated from a visit to an English tannery and it is still under development. Tanned turbot is a beautifully cooked, succulent piece of turbot, wrapped in a shiny jelly made from roast Charentais melon consommé. The jelly had terrific, concentrated melon flavours and a beautiful fish skin pattern. 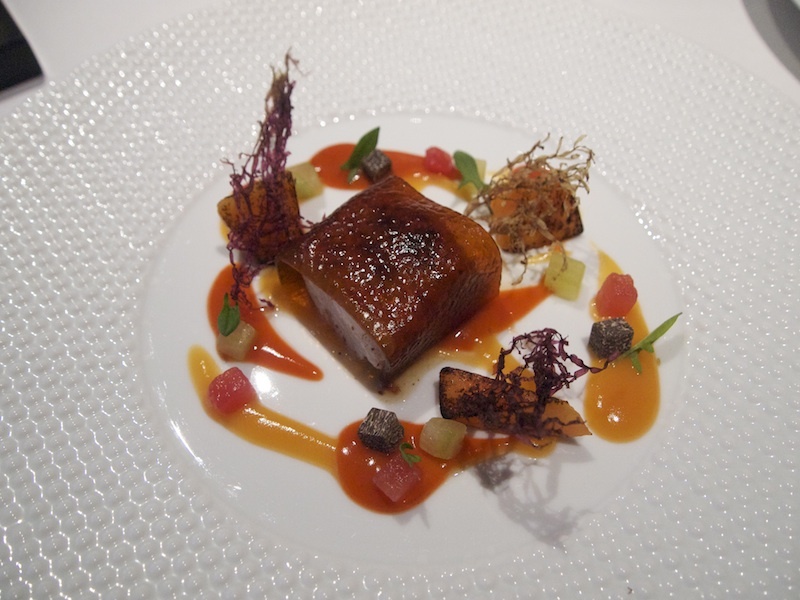 Also on the plate were a few cubes of truffle, cubes of fresh compressed cucumber, buttery blowtorched pieces of fermented melon, dried lantern articulata seaweed and two types of ketchup: carrot and sea urchin and melon. Both ketchups had an excellent balance between freshness and sweetness and the caramelisation of the melon was perfect. A surprising (I don't believe I had ever had roasted melon before) but delicious combination of flavours; only melon can deliver this elegant sweetness. Also a highly creative and evocative dish, that had a lovely balance between sweet and sharp flavours and a nice, warm and spicy finish. Next up was the seventh course. Partridge and Pear - partridge, celeriac, brussels sprout leaves, chestnuts, baby onions, spelt risotto. A wonderfully flavoursome and tender fillet of partridge and a leg meat, sage and onion chipolata served with a gorgeous, well-reduced and sticky, partridge sauce infused with pine and mandarin leaf. Nothing short of brilliant! 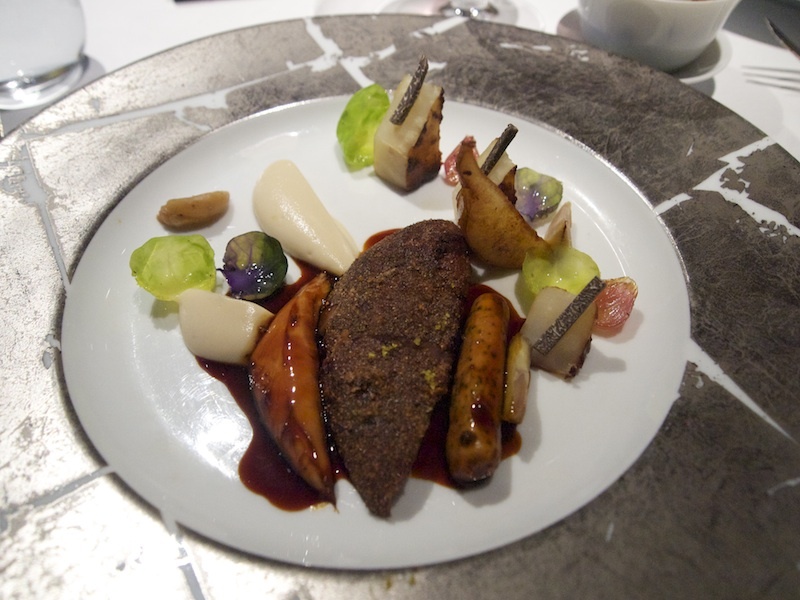 The partridge had a thin coating of chestnut flour and corn meal and was seasoned with mandarin and pine salt, which all combined perfectly; I loved the subtle hints of the mandarin. The above was accompanied by a gorgeous, sweet and soft, celeriac fondant, smooth and creamy celeriac puree, a few pieces of delicious roasted and chargrilled celeriac and some lovely sweet-and-sour baby onions. In a separate bowl came this utterly delicious spelt risotto. Creamy spelt risotto with three types of onion (caramelised, compressed and lightly pickled) thinly shaved truffle, sage leaves and a few pieces of sweet and sharp pear mostarda. A beautifully made risotto with an excellent balance between sweet, sharp, earthy and creamy flavours. A sublime dish with unparalleled intensity and energy. Eighth course: Hot & Iced spiced mulled cider. A Fat Duck classic where you experience hot and cold liquid gels in one drink, each part providing a different flavour sensation. I loved this Christmassy version. 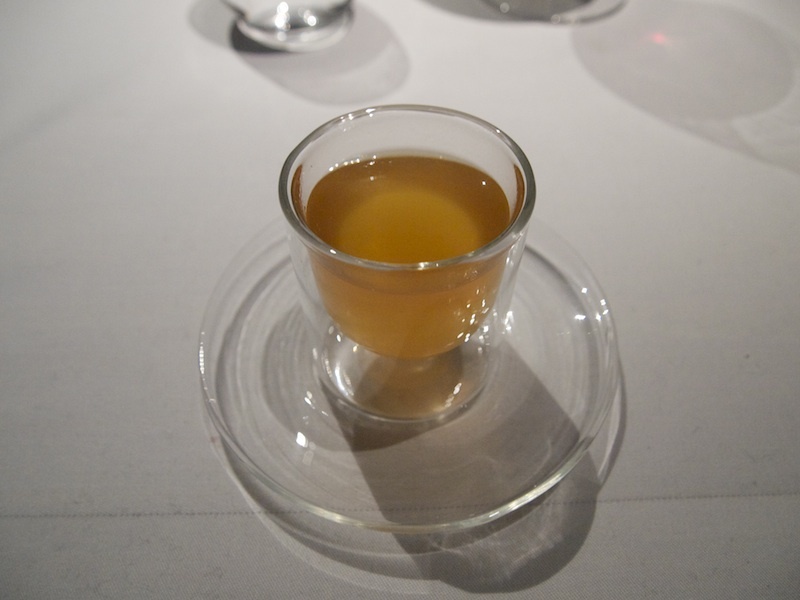 Ninth course: Botrytis Cinerea. 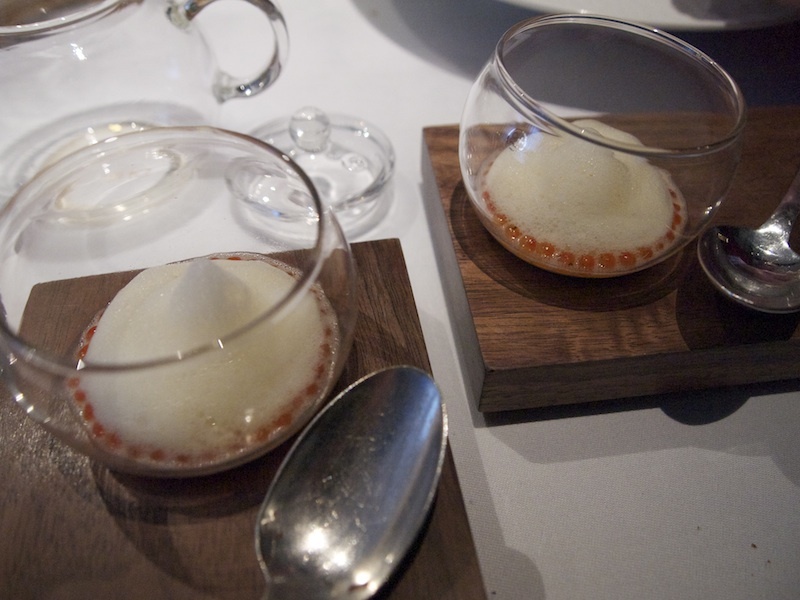 A new Fat Duck dessert that has been on the menu since October 2012. 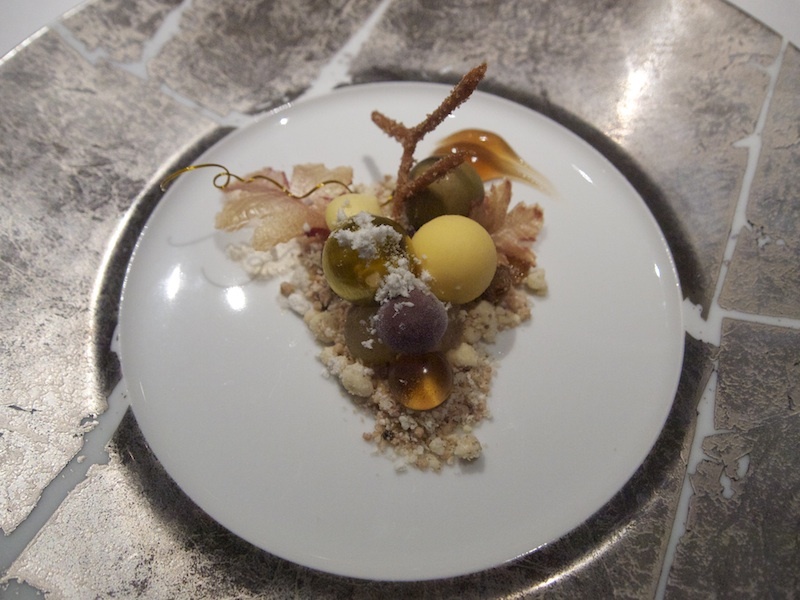 The various elements of this dessert represent the (deconstructed) flavours of Chateau d'Yquem. Each 'grape' on the plate had a different texture and flavour, from simple and elegant to very intense and complex. I will mention only a few: a transparent blown sugar grape with a delicious creamy citrus fromage blanc filling - a milk chocolate grape with an absolutely marvellous feuillantine, pear caramel and popping candy filling - a lovely, refreshing and citrus sorbet grape - a peach wine gum grape and edible soil made from crystallised chocolate, d'Yquem soaked raisins, Roquefort powder and vanilla salt. 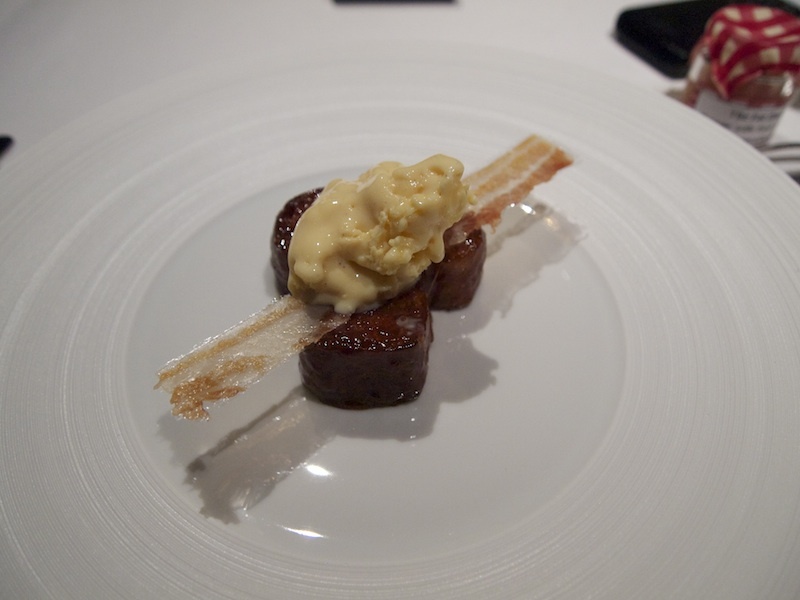 Apart from the grapes, there was a 'churros' stalk dusted with fenugreek-cinnamon, some Roquefort powder and grape gel. All these elements provided a wonderful harmony between sweet and savoury flavours. An impressive dish that shows an tremendous amount of skill and technique and that captures the flavours of Château d'Yquem 's Botrytis Cinerea infected grapes perfectly. You can't stop smiling when you're eating this dish. A true masterpiece. On to the tenth course. Nitro-scrambled egg and bacon ice cream. 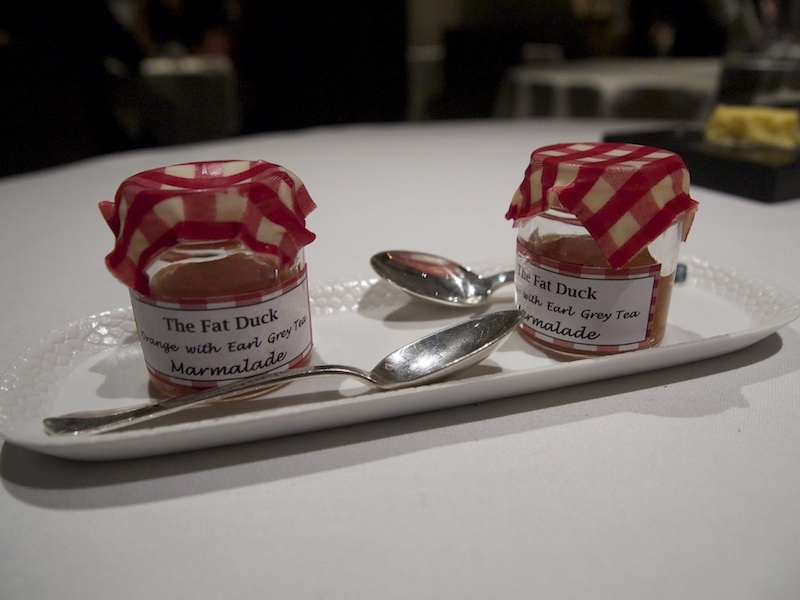 One of the Fat Duck's most legendary dishes and when it first appeared on the restaurant's menu, it was truly revolutionary. 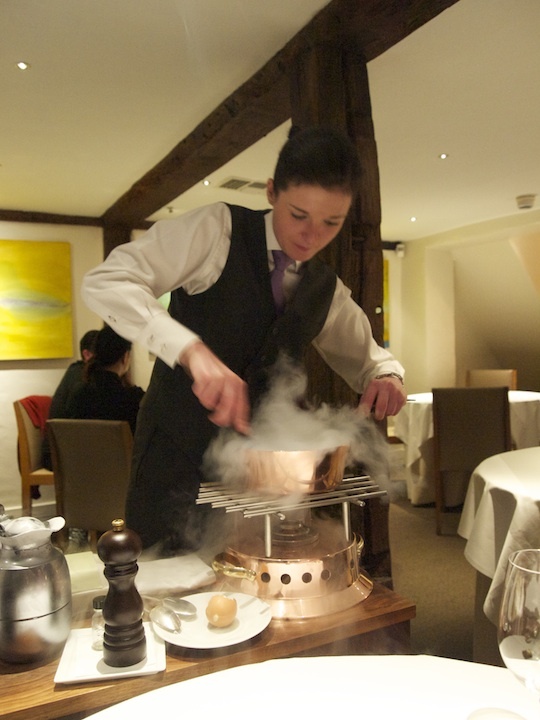 An egg custard mixture, hidden in a Fat Duck 'egg', is cracked in a pan. Then the liquid nitrogen is added and there you have it: scrambled egg ice cream. A fabulous savoury ice cream with the perfect touch of sweetness. The ice cream is served with a thin strip of sweet and crispy bacon and some nice and sticky, caramelised brioche. To complete dish breakfast dish, some sweet orange and Earl Grey marmalade is served on the side. The marmalade pot had a delicious edible white chocolate cover and the marmalade itself was lovely and tart. Next up were the Whisk(e)y gums. 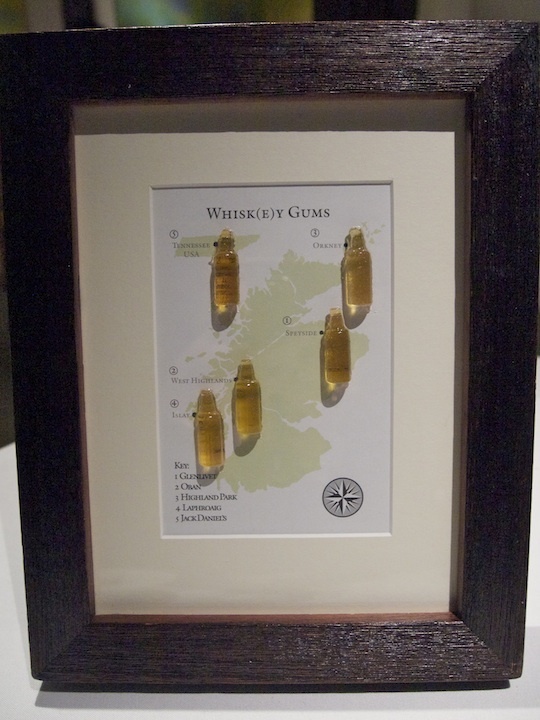 Bottle shaped whisky gums made with 5 different whisk(e)ys: Glenlivet, Oban, Highland Park, Laphroaig and Jack Daniels, each representing the character of that particular whisk(e)y. I believe the photograph speaks for itself. 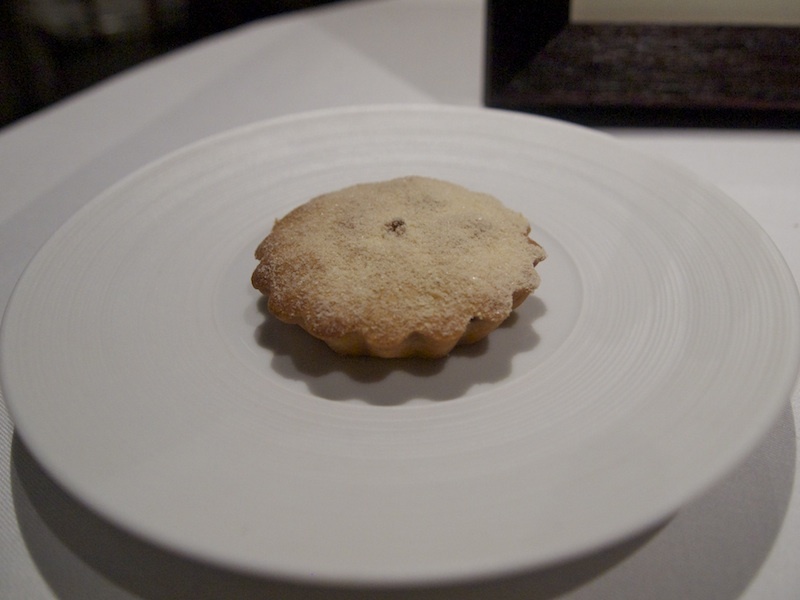 The gums were followed by a gorgeous mince pie with perfect thin sweet pastry and a beef and duck (!) filling. Eleventh course: Advent. The Advent candle had been presented to us with the second course of this Christmas menu but obviously this was not your average beeswax or stearine candle. This delicious candle was made from white chocolate with a milk chocolate, passion fruit caramel and popping candy filling. Twelfth and final course: 'Like a Kid in a Sweetshop'. 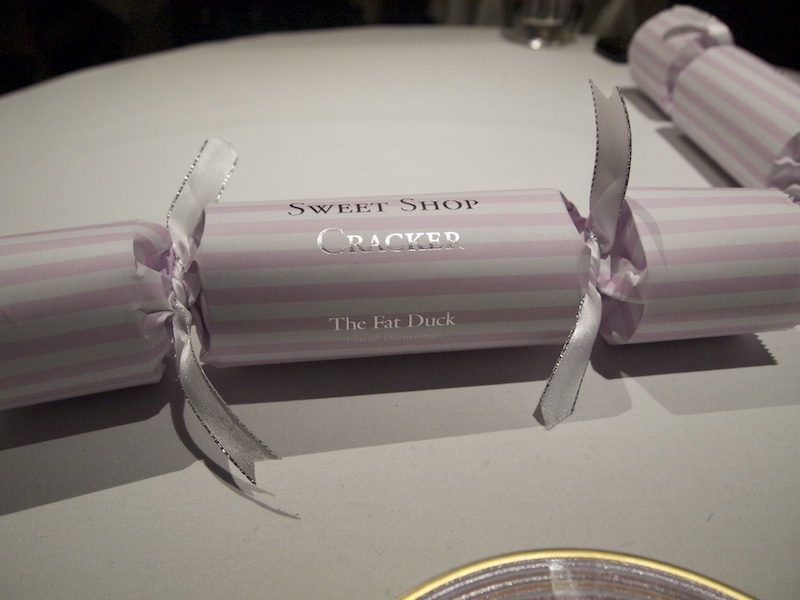 A great selection of Fat Duck sweets, served in a Christmas cracker: Mince pie caramel with an edible wrapper - Aerated chocolate with a mandarin jelly - Queen of Hearts (white chocolate playing card with raspberry compote filling) - Fat Duck coconut baccy (coconut infused with an aroma of Black Cavendish tobacco). What is there to say after a meal that leaves you speechless? This menu was once again crammed with dishes of a spellbinding beauty and resonance, that left me with a sense of wonder (to loosely quote Andrew Jefford). In my review of The Fat Duck last year, I already wrote my love letter to this restaurant and the people who make its miracles happen every day and I am not going to repeat it here. The innovative and creative nature of many dishes should not lead us to believe that The Fat Duck is a case of l'Art pour l'Art or even "le Trick pour le Trick". On the contrary: its creed is the search for perfection and in this quest, flavour is paramount. The search for perfection is a lengthy and cumbersome process and (new) dishes often take many months or even years of development before they are deemed worthy of a place on the menu of The Fat Duck. And even when they have arrived on the menu, the development and improvement go on ceaselessly. It would be easy for me to expend many words gushing over how messianically wondrous this restaurant is. I will however limit myself to repeating the statement I consider most to the point: I (still) have never eaten at a better restaurant than The Fat Duck.